Tony returns to his serious roots - but how does the PSP's single analog input hold up? It had to happen- Tony Hawk had to return to the Sony PSP sometime. The last we saw of him, he was skateboarding in an all-out prank war against Bam Margera in the somewhat likable Tony Hawk's Underground 2 Remix. But now Tony's back to his serious roots with Tony Hawk's Project 8, a game that tries to refocus on what made the skateboarding series so much fun to begin with- the actual skateboarding. Tony stops in the local city to begin recruiting for an elite group of skateboarders he can support, and it's up to you as the skateboarder to make your way onto his list. But it's not easy- there are several skateboarders that are competing on the same lines as you. So you have to complete tricks, random tasks around the city, and other various challenges to prove your worth. Fortunately, many of the tasks pose a great challenge, from completing a lengthy grind on a rail without falling off to pulling off enough tricks to earn a "sick" rating and scoring major points with the locals. The game's a wonderment on the consoles, thanks to a wonderful control scheme put together by the folks at Neversoft. The same control scheme, however, doesn't quite work as well on the PSP. That's because there's no second analog stick, meaning that the trick system relies heavily on the D-pad and face buttons. Typical functions work, but trying to pull off some of the harder tricks in the game takes lots and lots of practice. Page 44 was able to incorporate Nail the Trick mode into this version of the game. Let me draw out Nail the Trick for you. This is where the game enters into a slo-mo, build-your-own trick phase. The D-pad and face buttons are called upon to control the feet of your skateboarder, so you can twist and turn around the board as you please. It's a fantastic addition, and players will be tweaking their tricks to no end, but like the gameplay, it takes patience and time to really nail down- especially considering that the analog nub has to be pressed downward each time to activate it. It should've come more naturally. The visuals also take a bit of a hit on the PSP. Although the game isn't a miserable-looking mess by any means (there is a large city in which the skateboarder can go through), the game takes forever to load between segments. Furthermore, the animation and details seem to resemble that of a first-generation PS2 game instead of something fully accustomed to the hardware. This might frustrate those expecting extreme details like the console version- you have a shrunken down system, you get a shrunken down experience. Fortunately, the sound is where it's at, complete with a well-chosen soundtrack (hip-hop and alt rock aplenty) and some convincing voice work by Tony Hawk and company. The game does support AdHoc multiplayer, but no Infrastructure. That's a shame, because the next-gen console versions lean heavily on their online community. But players who can hook up in the same room will still have fun with many of the games included, such as Sticker Slap and Obstacle Course. Course is an all new mode that's a full-on race from point A to point B, complete with plenty of items to weave around and jump through. There's also plenty of customization features (although not as deep as we'd like), and a free skate mode to practice your wares. 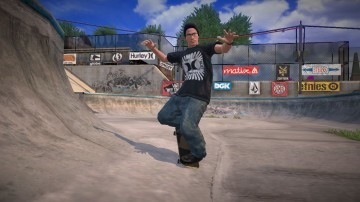 Tony Hawk's Project 8 for the PSP isn't as great a game as the console versions. How can it be? It has no real way to resemble the controls without a second analog stick, and the graphics almost feel like an afterthought. Regardless, if the PSP system is all you have, it's a suitable version for on-the-go skating, especially with the multiplayer and Nail the Trick. That should leave some of you spinning around the board in slo-mo for quite some time...until Project 9 eventually comes into play. What's Hot: Nail the Trick is addictive as hell; the AdHoc multiplayer is pretty good. What's Not: Gameplay takes some practice without a second analog stick; graphics could use more work.